The Fuller Center’s covenant partner on the ground in Armenia passed the 500-home milestone earlier this year, and a significant portion of the families helped has been the result of its partnership with VivaCell-MTS, the country’s leading mobile communications provider. Over the past five years, 135 families in 10 different regions of the country have been able to move into simple, decent homes thanks to the partnership. 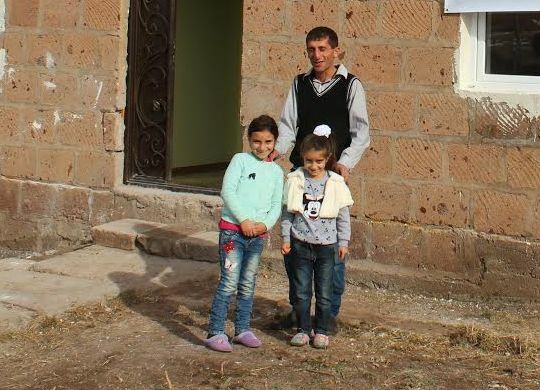 The Armenian Weekly reports in the link below on the latest families to receive a hand-up into better housing, including the Torosyan family of the Nahapetavan village in the region of Shirak. “VivaCell-MTS and the Fuller Center for Housing could implement programs separately, but unity is productive in terms of both successful cooperation and the number of people receiving support. This cooperation is worth it, and the greatest happiness is to see our compatriots solving their problems,” VivaCell-MTS General Manager Ralph Yirikian told the Armenian Weekly.